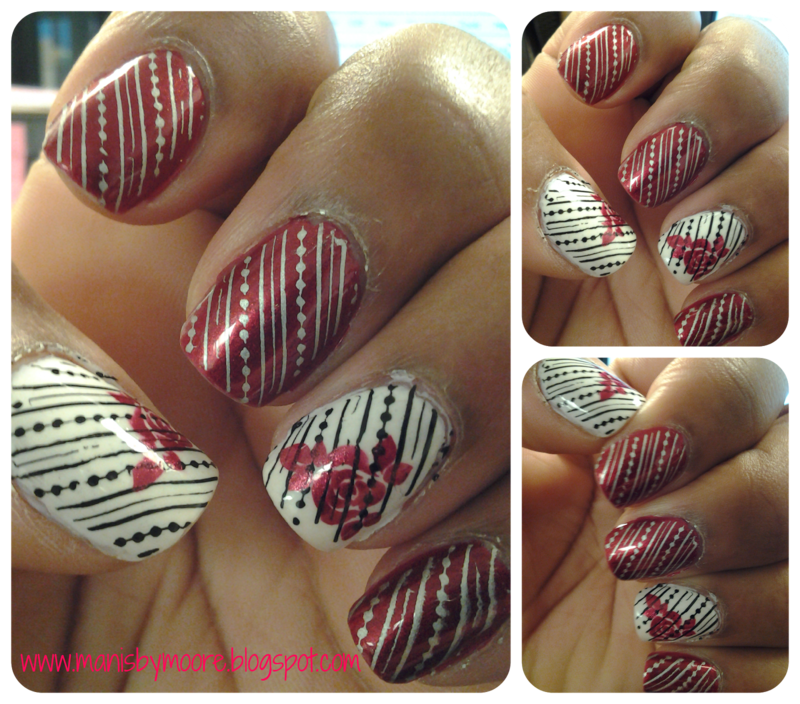 I used China Glaze Cranberry Splash on my index, middle and pinkie fingers. On my thumb and ring finger I used Orly Dayglow. Dayglow is a very pretty white polish with blue undertones. I am really happy with this polish even though this is my first time using it. On my index, middle and pinkie finger I used Konad image plate m65 and stamped with Sally Hansen Silver Sweep (I am getting low and need to pick up some more). On my thumb and ring finger I used the same image plate but with Mash Black and then used GCOCL B02 plate for the rose and stamped with Kleancolor Metallic Red. I was finishing up my nails late last night and did not want to chance and see if Cranberry Splash stamped so I went with something I knew would stamp. The hubby loved these...but he loves anything red! I am wondering if he really cares or just humors me?? LOL!